Ubuntu release is always awaited by its enthusiasts, not only the Final but also the beta and alpha version are always have a concern, Ubuntu 12.04 'Precise Pangolin' for Final which scheduled to be released tomorrow was already expected by a lot of people including me. At each release of ubuntu, before the its coming to the Final version is always performed alpha and beta version, in normal conditions a final version should will not be much different from the beta version in terms of Appearance/look, Function and its Menu. To prepare for Ubuntu 12.04 Precise Pangolin release, here following summary of changes and improvement that you will meet in Ubuntu 12.04 Precise Pangolin for Final, the following data are collect from our observation in the alpha and beta releases (self opinion), and we gather from other ubuntu supporter blog (thanks to: techdrivein, omgubuntu, webupd8, and softpedia). Unity Dash's Home Screen has Changed , Unity Dash's default home screen has changed. Now, it shows 'Recent Apps' first, 'Recent Files' next and lastly, your most recent Downloads. Take a look at screenshot below and see how the Dash homescreen used to look like prior to recent changes. HUD is a Default Now, The HUD now adapts to your Launcher auto-hide and icon-size settings. Unity Dash Quicklist, As if to compensate for the loss of older homescreen, Unity Dash now has quicklists support, which is really nice. Launcher Icons Can Now be Resized, Size of launcher icons can now be changed directly changed from 'Wallpapers' menu. No need to install CCSM just to do that anymore. Default Launcher Behavior Changed, This is perhaps the biggest visible change to new Unity. Launcher won't be in the 'dodge windows' state anymore (by default) and instead will be 'always visible'. Dodge Windows is Not Even an Option Anymore, In the same Appearance window we talked about earlier, there is now a new 'Behavior' tab where you can set the Launcher to autohide. Changes in Alt + Tab Behavior. Gnome Classic (properly referred to ‘GNOME Fallback’) feel like never change. Redesigned Sound Settings panel offers an option to switch off the Sound Indicator. Ubuntu 12.04's Comes wiuth new Configurable Privacy Menu. Updated LibreOffice and Firefox packages. 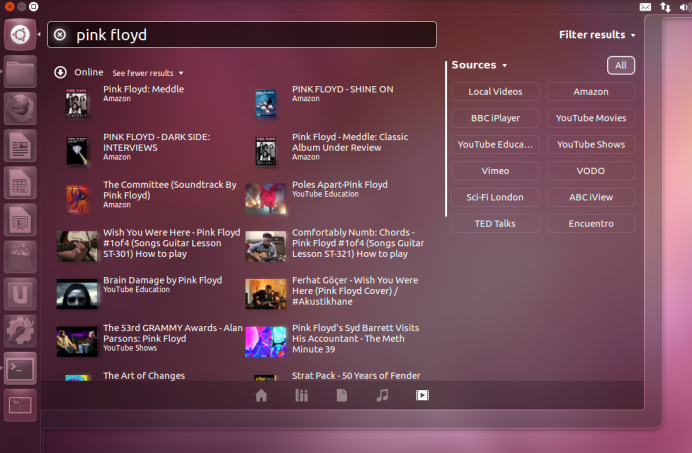 Some updated apps from GNOME 3.4. Qt-based Ubuntu One desktop client. Goodbye Banshee, Welcome Back Rhythmbox!. Ubuntu 12.04 is too big to deliver with CDs, One of the more notable developments is that it looks like developers are planning to target a 750 MB ISO image for Ubuntu 12.04, meaning that the software will no longer fit on a CD, according to a report on The H. Instead, users will need either DVDs or USB drives to install it. The change may seem shocking, but it's actually an increase of only 50 MB. 64-Bit by Default, Also notable in Ubuntu 12.04 is that users will be offered the 64-bit version by default, though the 32-bit version will still be available. Version 3.2 of the Linux kernel, meanwhile, will serve as the heart of Ubuntu 12.04, according to a report on Phoronix. A Wayland Preview, While Ubuntu 12.04 will still depend on X.Org as its main server, an experimental Waylandpreview running an X11 server may be available as well, Phoronix reports. No Mono by default, along with the removal of the banshee, ubuntu 12.04 not included mono by default.